Kathy Navaroli, 50, of Windsor, hadn’t seen a primary care doctor in years when she decided to go for a physical this summer. She didn’t ask about preventive care screenings, such as a mammogram or Pap test, in part because she worried they might involve an insurance co-pay or deductible. Her household income is below $30,000 a year. “I got a physical, they did some blood work, and that was it,” she said. Kerrishian McCants, 31, of Hartford, a mother of four, has a family history of diabetes and high blood pressure, but has not discussed those possible risks with her doctor. She hasn’t asked about preventive care or screenings, she says, because she doesn’t want to pay extra on her limited income. The two women are not unusual, according to a health-care utilization survey of 444 state residents conducted by the Conn. Health I-Team. While 88.4 percent of residents surveyed said they have a primary care doctor, only slightly more than half said they had received preventive screenings in the last two years. Of those who said they had not received preventive care, 59 percent said they believed such services would cost them money out-of-pocket, in co-pays or deductibles. That perception persists in Connecticut despite an expansion of free preventive care since the passage of the Affordable Care Act. Adults are now entitled to 15 preventive services, including depression and diabetes screening, diet counseling, and tobacco-cessation programs, while women are entitled to 22 other preventive services, including mammograms, domestic violence screening and counseling, and osteoporosis checks (for those over 60) — with no cost sharing. The survey, distributed in New Haven, Hartford and surrounding towns, found that 44.4 percent of respondents said they had not received preventive care screenings, such as mammograms and diabetes screening. Whites were more likely than African-Americans and Hispanics to report receiving such care – 62 percent, compared to 46 percent of Hispanic respondents and 58 percent of African-Americans. Preventive care also was more likely for those with higher household incomes – over $50,000 – than for those below $50,000. Forty-eight percent of respondents who had not received preventive care said that concerns about cost were a reason. Pat Baker, president of the Connecticut Health Foundation, said the finding that respondents were worried about cost in accessing preventive care was concerning — but also an opportunity for improvement. “If they are limiting their own access because of fear of cost, I think we have to look at, what are the systems in place and the obligations of the system and others to make sure that as people sign up for coverage or renew coverage, we put a headlight on the message: ‘Preventive care is covered,’” Baker said. State Healthcare Advocate Victoria Veltri said she was not surprised that many people believe preventive care will cost them money, given the high deductibles and cost sharing under some plans. The survey found that while 88 percent of all respondents reported that they had a primary care doctor, whites were more likely to report having a provider (93 percent) than Hispanics (86 percent) and African-Americans (84 percent). People with household incomes exceeding $50,000 were more likely than those with lower incomes to report having a primary care physician. Eighty-two percent of respondents with incomes between $30,000 and $50,000 reported having a primary care provider, compared with 96 percent of people earning $50,000 to $100,00. Some of the findings mirror those in a recent survey by Access Health CT, the state’s health insurance exchange. That survey found that 36 percent of exchange customers had not used their insurance coverage in 2015, up from 26 percent in 2014, and that 28 percent lacked a primary care physician. Customers who were white, older and had a bachelor’s degree or higher education were most likely to have used insurance and have a primary care provider. 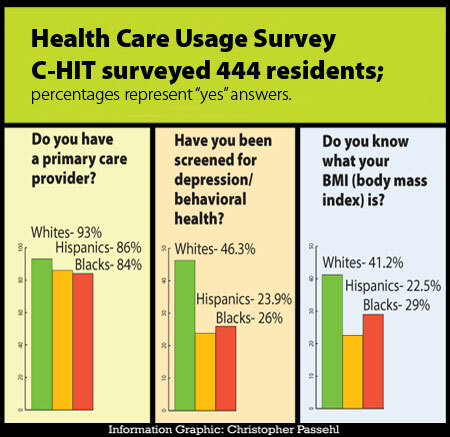 The C-HIT survey found racial/ethnic and income disparities in respondents’ receipt of preventive care. The majority – 70.7 percent – of those who reported seeing a primary care doctor in the last three years said they had not been screened for depression or other mental health problems. Whites were far more likely to report such screenings (46.3 percent) than Hispanics (24 percent) or African-Americans (26 percent). Despite the focus on obesity, only 31.6 percent of all respondents reported knowing what their BMI (body mass index) was. Of those who reported that their BMI was high, only 52.6 percent said their clinician had talked to them about it and recommended interventions. Those discussions were more likely for whites than for Hispanics and African-Americans, and for higher-income residents than low-income patients, according to the survey. In terms of individual procedures, rates for some preventive services rose as household income rose. Overall, 72.6 percent of respondents over 50 said they had received colonoscopies, but the rate for people with incomes under $30,000 was lower than for people with higher incomes – 64.4 percent, compared with 78.7 percent for those with incomes between $50,000 and $100,000. Pap testing followed the same pattern. One exception was mammograms. Women in households earning $30,000 to $50,000 were more likely to have had a mammogram in the last two years than those in higher-income groups, and African-Americans and Hispanics reported higher rates than whites. CT residents discuss their health care usage. Baker said she was not surprised by the racial and income disparities, saying the uneven use of preventive care stems largely from “the quality of the interaction” between providers and patients. “Consistently, almost across the board, we know that people of color are not offered the same level of screening and care – and yet, they, in fact, shoulder a huge burden of health outcomes,” she said. Similarly, income and education levels impact the quality of care. How much of the reason for that disparity is related to the provider offering services, and how much to the patient requesting services, is unclear. In the case of a patient with a high BMI or obesity, for example, “that can be a challenging conversation” for a provider to have with some patients, Baker said. “Good preventive screenings shouldn’t be dependent on patients asking questions,” she said. Both patients and providers need to be encouraged to stress preventive care; “it needs to be a partnership,” she said. Chronic conditions that can be detected early, such as heart disease, cancer and diabetes, are responsible for seven in 10 deaths among Americans each year, and account for nearly 75 percent of the nation’s health spending, according to the Centers for Disease Control and Prevention. • 68.5 percent of respondents said they would contact their primary care provider if they had a virus or flu, with 28 percent saying they would go to a hospital emergency room or clinic. • 85 percent of respondents said they had spoken to their primary care provider about their family medical histories, with women more likely than men to have had those conversations, and whites more likely than blacks or Hispanics. • 36 percent of respondents reported a history of smoking within the last 15 years, but just 38 percent of those people reported having a chest X-ray in the last five years. • 78 percent of respondents reported having an annual physical exam in the last year, with Hispanics and African-Americans reporting higher rates than whites. • About one-third of respondents reported traveling between 20 minutes and one hour to see their primary care provider. • 3.6 percent of respondents said they had no medical insurance, similar to state estimates. C-HIT data analyst Matt Wynn contributed to this story. This Wednesday, Oct. 7, C-HIT, in collaboration with ConnectiCare, is hosting a free forum, “Get Health Wise: The Benefits of Preventive Care,” from 5:30 to 7:30 p.m. at the Artists Collective, 1200 Albany Ave., Hartford. The keynote speaker is Dr. Jewel Mullen, commissioner of the state Department of Public Health. Register here.